Since the introduction of generational play in The Sims 2, family and parentdom has been a key part of the Sims series. However, the most recent two entries in the series received complaint from some (myself included) to the tune that childhood and teendom felt underdeveloped, especially compared to the wide variety of content that later expansions added for older sims. For 3, Maxis’ response to this was the Generations expansion which focused on younger sims and elders. Parenthood seems to be the Sims 4 equivalent to that. Now let’s get this out of the way first: I hated Generations, as anyone who’s ever brought it up in conversation with me would know. But I hated the pack for reasons relating to its implementation, as opposed to it’s ideas. Idea-wise, Generations was solid, and I feel the same way about Parenthood. There’s nothing wrong with adding more depth to several life-stages that felt like they were added to the game as a second thought because someone at Maxis remembered them when the game already had one foot out the studio door. But should most of the content of both Generations and Parenthood have been in the base game releases and none of us should have had to pay extra for it? Yes, absolutely. Hey look it’s the bit that matters the most. The pack is solid here. A lot of expansion has been done on the interactions between young sims and their parents. There’s a new Parenting skill that lets adults get better at being a parent as they gain more experience with the role. 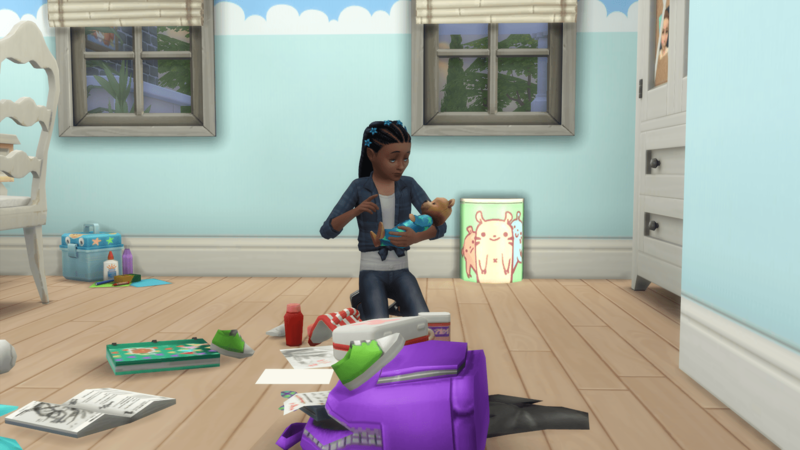 The skill unlocks a number of interactions that sims can perform on their kids in order to help them develop better (or worse) traits as they age into young adults. Speaking of traits, there are (a whopping, considering the track record) 11 of them included in this pack. 1 of them is gained by completing the new Aspiration, while the other 10 can be earned from the new “Character Values” system. 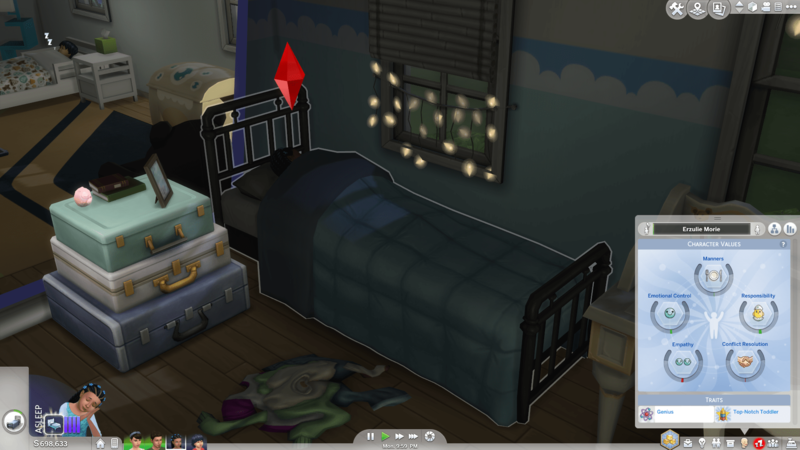 A new element has been added to Toddler, Child and Teen sims Simology panel that tracks the status of five values. They can be in either the positive and negative, and getting any of them high or low enough will award a trait once the Sim ages up to a Young Adult. This is a really cool idea. I often think that Sims games could improve by having sims develop their personalities through their lived experiences, as opposed to being chosen by the player every birthday. Character Values seems like a step in the right direction. Parents can take an active role in encouraging certain values but they can also be developed through everyday actions, like cleaning the dishes or being nice to others. There are also chance card-type events that can affect a sims character. All in all, this feature feels very well integrated with the rest of the game. The awarded traits themselves do indeed affect how the sim plays. 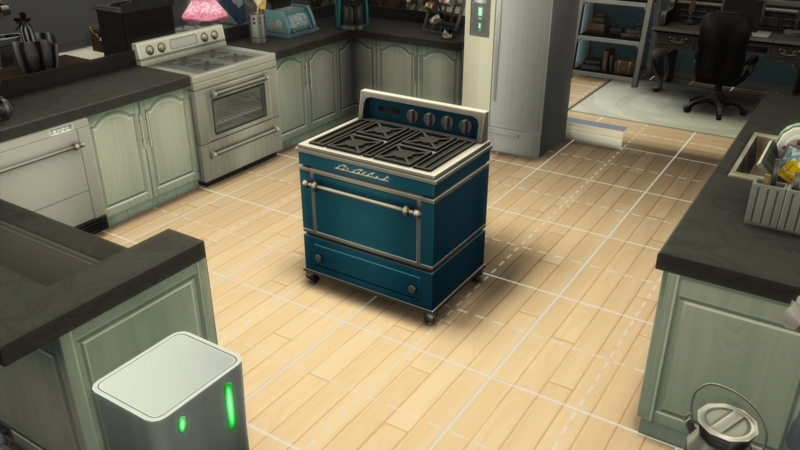 Argumentative sims seem to have trouble forming new relationships and ill-mannered sims wont autonomously clean their own dishes, to name two examples. As the main mechanic of this pack, Character Values worked out really well as both something to do while your sims are children, and something that fleshes them out for the rest of their short, pointless lives. As for other gameplay stuff, curfews are back from Sims 3. They’re optional this time (thank god) and they’re not enforced by psychic police. They’re a nice feature and the ability to break them helps characterize teens as more than just slightly shorter adults. There’s nothing particularly notable about the new CAS assets this time around. There’s an acne face detail, which is a tad disappointing. It looks fine, but I was hoping that zits would be a gameplay thing, as they were in 2. There are a few new hairstyles, but none that I’m particularly enamored with save for maybe the cute twists with the flower clips that female children get. As for the adult to elder category, there are a few pieces obviously aimed at teenagers and I like the jeans with a plaid shirt wrapped around the waist. But that’s about it. I can see myself using the stuff, which is more than I can say for what came with some packs. There’s nothing in Build mode save for a cute door intended for children’s rooms, two windows and some new wallpapers. The real treasure is in Buy mode. Bizarrely, there is absolutely nothing in the way of new toddler toys or beds, but there are two really nice new single beds. There seem to be two styles of decor in this pack, the weathered country theme and generic kid-friendly furniture, like something one would find in the children’s section of an IKEA, all round corners and extra storage. The new counters follow the rustic theme and are absolutely lovely. There are also some new 4×4 coffee tables, which are a neat. There’s a new shower/tub combo that has some really nice shower curtain options and a lovely sink that looks like it could belong in a utility room. And I am absolutely in love with the new stove. Just look at this thing. It looks like a car. There’s also a decorative bread box(!!! ), but that’s the highlights of it. Everything else isn’t anything we haven’t seen before. Brand new items include a diary, a building block (think Lego) table, a toy doctor’s kit and school project boxes. The diary is pretty boring. Sims can write in it for a positive moodlet and an increase to Emotional Control, reread it to gain back the mood that they were in when they last wrote, and other sims can snoop if they so choose. The table is nice but I’m kind of over this whole trend of adding new activities that can only be done on specific tables. I’d much rather be able to place a block set, a deck of cards or drawing set on any given 1×1 dining table rather than fill my sims’ house with ten different mismatched tables. The doctors kit comes in two varieties, teddy bear and baby doll. They’re functionally the same, and both are adorable. The school projects are neat. Kids will sometimes bring them home from school and they can also be bought from the catalog. There seem to be grade bonuses for completing the project quickly and doing the project sloppily or carefully affects the project’s final appearance. It’s a small little feature, but I like it a lot. This pack followed Vampires’ lead and added some truly lovely new music to Build/Buy and CAS. If new packs continue this trend, or we gain the ability to disable certain tracks, I could see myself muting the game during long stints in build mode a lot less. I don’t know who they had to fire to get this to happen, but I’m glad they took their horrible plinky piano noises with them. I like this pack. It approaches the same problem that Generations did, but implements it a lot better (for half the price, no less). I still feel that most of the content in Parenthood ought to have made its way into the base game, as playing children and teenagers without it just feels empty and half-baked. I’m not going to go off into conspiracy theory territory and posit that it was left out of the base game in order to charge and extra $20 for it later. But I do think that a fully fleshed out childhood in a series where family play has always been a focus shouldn’t be locked behind a $20 DLC. But I did love the pack, and would highly recommend it as a first buy for anyone just getting into the game’s addons and who enjoys playing families. It doesn’t add any great new adventure to the game like University or World Adventures did, but it’s something more in the vein of Freetime, that adds to the sims’ daily lives, making them feel more human.